We always do our best to keep the NOWA Watch app up to date. We would be grateful if you could report to us any issues or bugs when using with your device. We wish you to be completely satisfied with wearing the NOWA Thin Smart watch. Download the NOWA app, set your watch, then enjoy the best of modern lifestyles with a refined, stylish look! Open this page on your phone and select iOS or Android to download the NOWA Watch app for your watch. Important note: Do not try to pair the watch directly in Bluetooth Settings. 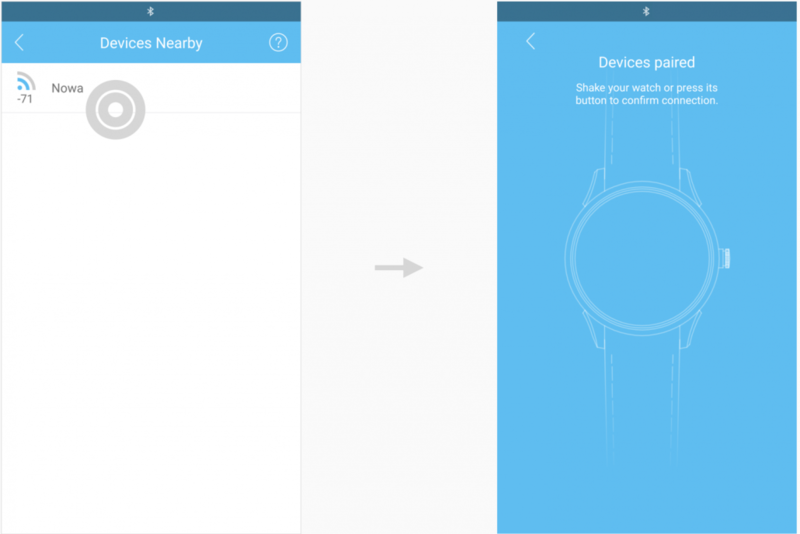 Install the NOWA Watch app first then connect your watch through the app. Follow details instructions here on how to pair your watch. Watch the video to learn how to pair and set time on your watch. Or go here to follow detailed instructions. The NOWA watch is packed in factory mode for safe storage and shipment. The watch is powered Off and the hands are not moving. In the factory mode, the Bluetooth is disabled so your watch won’t link to your smartphone. To check the battery status in factory mode, short push the crown. If the red LED indicator blinks 4 times slowly (2 secs at 2 Hz), the battery is in good condition (not discharged). Take out the watch from its box then long press the crown for 3 seconds to exit the factory mode and activate your watch. The red LED indicator blinks 8 times quickly (2 secs at 4 Hz). The hands start spinning and the Bluetooth turns On. The watch is now visible in the Bluetooth device list on the phone. 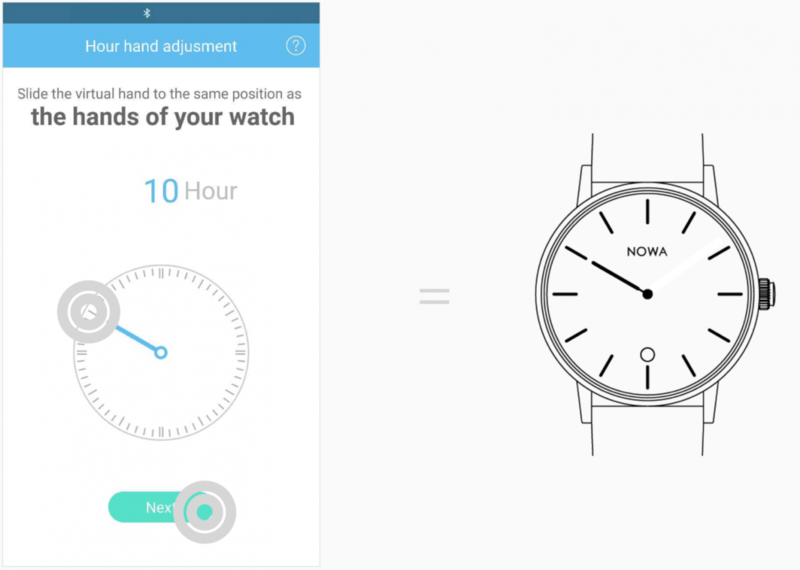 You can pair and connect your watch using the NOWA watch app. At this point, your watch is now activated (out of factory mode), and the clock is ticking. You can turn Bluetooth On/Off anytime to save the battery. If the red LED indicator blinks one time, the Bluetooth is disabled. If the red LED indicator blinks 8 times quickly (2secs at 4 Hz), the Bluetooth is enabled. The watch is now visible in the Bluetooth device list. Important note: Turn Bluetooth Off when not using your watch. The main functions of the watch will still work such as displaying time and tracking your activities. It is only necessary to turn On the Bluetooth from time to time to sync data or to use smart features over a short period of time. If the red LED indicator doesn’t light on, the Bluetooth is turned Off. If the red LED indicator blinks 8 times quickly (2 secs at 4 Hz), the Bluetooth is turned On but not linked. If the red LED indicator lights up for 2 seconds (no flashing), the Bluetooth is turned On and the watch is connected. If the red LED indicator blinks 4 times slowly (2 secs at 2 Hz), the watch is in factory mode, and the battery is in good condition. To put back the watch in factory mode, push and hold the crown for 10 seconds until the red LED indicator blinks 7 times. The hands stop spinning and the watch powers Off. For Android phone: Google requires Location service (GPS) to be enabled to pair and connect any Bluetooth device. If location is disabled, the watch can’t connect to your phone. For iPhone: If it is not the first time that you are pairing your watch to your iPhone, forget the device Nowa in Bluetooth Settings first before pairing your watch again. 1. Turn On Bluetooth on the phone and launch the NOWA Watch app. Important note: If you are setting time for the first time, skip the app guidelines for Watch Pairing. 2. Go to App / My watch / Watch Settings / pair and stay on the page Devices Nearby. Important note: Allow NOWA to access photos, media, files and your location on your device, as well as to take pictures and record video. 3. Take the watch out of the box then push and hold the crown of the watch for more than 3 seconds until the red LED blinks several times. Now, the device can be found and displayed in the device list. 4. Tap on the name Nowa that appears on the page, and the app will start pairing. The Device paired message appears once the watch connects successfully. Important note: If your watch is not found, Swipe down on Devices Nearby page to search for your device. 5. Push the crown of the watch to confirm connection. Important note for iPhone: Accept the Pairing request that appears immediately after the watch connection confirmation. Important note: Pair and connect your watch first before updating tracking data on your device. 2. Turn On Bluetooth on the watch by pushing and holding the crown for 3 seconds. Your watch automatically reconnects every time you open the NOWA app with Bluetooth enabled. 3. Swipe down on My Whole Day page to sync data. It is normal for reconnection to take a few seconds. To speed reconnection, simply push the watch crown to wake up the device. Sync your watch with the app at least once a week. 4. 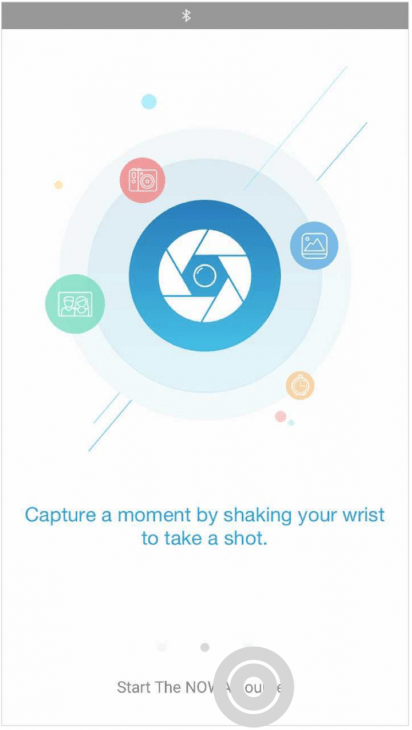 Once the data downloaded, turn Off Bluetooth on your watch by pressing the crown again for 3 seconds. To save battery life: Turn Off Bluetooth on your watch when not connecting the app (The watch still tracks your activities). The NOWA watch is designed to track your daily activity and for smart features (call reject, camera control) during a short period of time. We do not recommend you to keep your watch always connected. 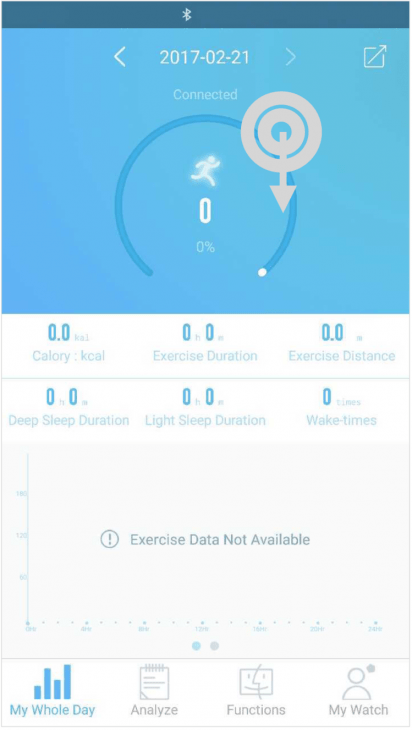 You can connect the app from time to time (once a day) to collect data. The NOWA Watch app detects Time Zone changes and automatically adjusts the time on your watch. If you need to change the time zone on your watch by yourself, you can set time on your watch manually. Important note: If time zone doesn’t change automatically, simply connect your watch then manually input the watch hands position into the app to reposition the watch. The NOWA watch is designed with a snap off type case back and works with a standard CR2025 e-cell. To ensure water resistance and product integrity, bring your watch to an authorized watch shop to change the battery. 1. Release the strap and secure the watch case upside down in the holder. 2. Insert the flat blade under the raised lip on the watch case back. 3. Twist the blade so that the back unclips from the watch case. 4. Replace the CR2025 battery using the thin screw driver to extract it gently. Ensure that the red LED blinks several times. If not, remove the battery and put it back. 5. Use a watch press tool to close the case back. Remove the strap then protect the case using soft fabric on top and bottom of the case. Important note: Do not try to use a kitchen knife or a screwdriver to lift up the watch case back. 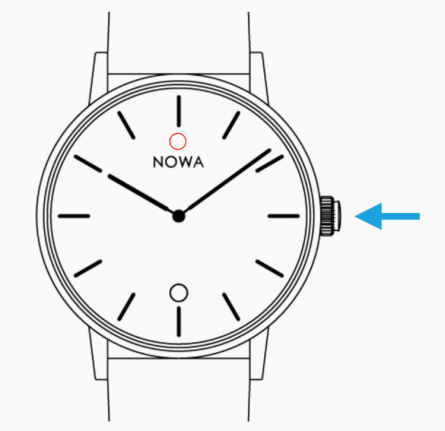 The NOWA watch enters into factory mode automatically with Bluetooth of the watch powered Off and with hands stopped. Follow the instructions here on how to activate and pair your watch.